...appears to be missing on my spare headlight that I'm going to use in my TC. can they be replaced/repaired? Get a threaded rod or long bolt with the correct diameter / thread and a nut that fits the bolt / rod. Clean out the hole the best to can with brake cleaner, etc. Cut the head off the bolt or cut the rod to the correct length, and screw it into the boss the best you can using JB Weld in the hole and on the cut off bolt / rod threads. I have made a number of repairs like this and the repairs have never failed. 88 Turbo Coupe: Intake and exhaust mods, T3 turbo at 24 psi, forced air IC, water injection, BPV, Ranger cam, subframes, etc., etc. 86 Tbird 5.0 (original owner): intake, exhaust, valvetrain mods, 100 HP N2O, ignition, gears, suspension, etc., etc. thanks, Jeff K. I think Vinny might have a stud he's going to send me. The part that goes into the plastic is like a machine screw while the other end is your standard bolt thread. Cut the head of a machine screw and weld to the matching bolt size. Publicity, fame and accolades can make a theory popular. They can't make it true. 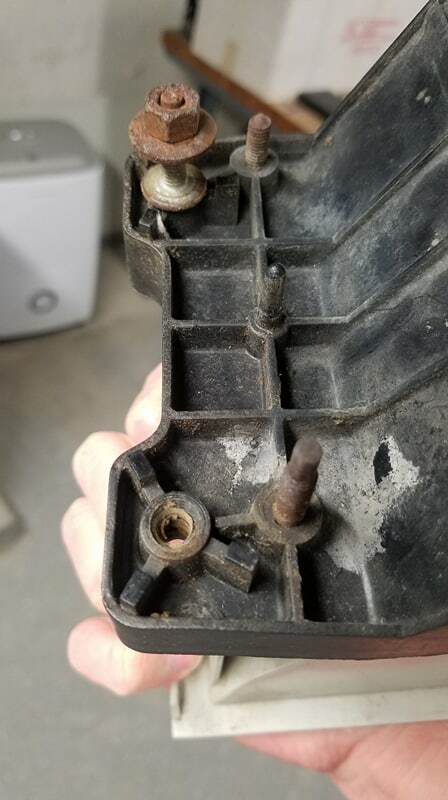 (03-30-2019, 11:56 PM)MN88TurboCoupe Wrote: The part that goes into the plastic is like a machine screw while the other end is your standard bolt thread. Cut the head of a machine screw and weld to the matching bolt size. I have a stud coming my way. North American Turbocoupe Organization (NATO) is dedicated to the preservation and enjoyment of 1983 - 1988 Ford Thunderbird Turbocoupes.